For the last few years, the Bulls have consistently been one of the most eye-catching teams in Super Rugby – not so much for their play, but for their bold, unconventional jersey designs courtesy of Puma, usually involving some wild sublimated graphic or another that polarised fans and critics alike. Sometimes, it really worked, sometimes it was all a bit weird and sometimes… well it was an unmitigated disaster. But you know what they say, you have to go home sometime, and for 2017, Puma and the Bulls have taken the unexpected step of embraced the retro trend that has swept the rugby world. 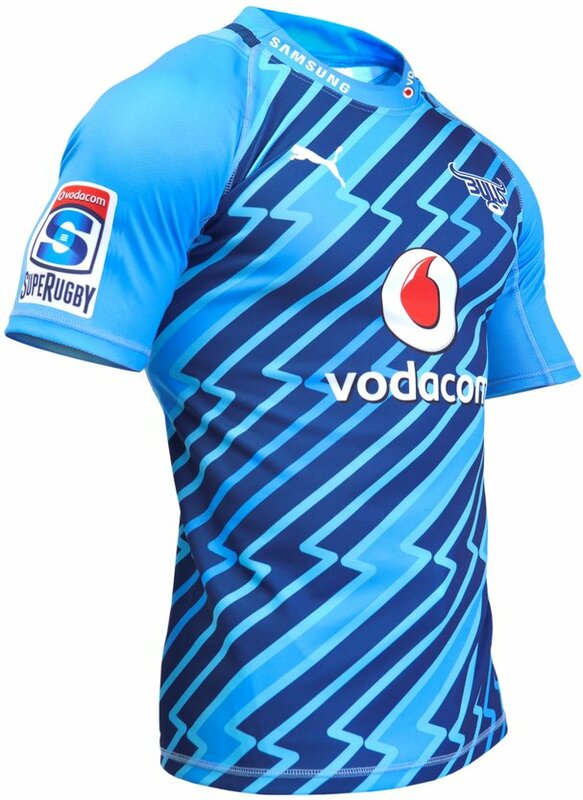 Yup this year the Bulls have opted to pay tribute to their history, and indeed the history of Northern Transvaal rugby with their ‘Forever Blue’ jerseys. There’s not a stylised bull graphic anywhere on these two jerseys – instead we have the most classic, most traditional design we’ve seen for the team in years. So in its place we have a classic plain blue home shirt with dark blue accents, on the sleeves, side panels and collar, and asides from a bit of contrast stitching, that’s about it! The only other bit of contrast is a large dark blue panel that runs around the back of the bottom of the jersey – subtle and probably hidden most of the time on the pitch, but it looks rather striking untucked. We also get a very interesting collar design – it’s a mixture of a grandad-style system (complete with button) and a more common stub method. It looks really cool, and suitably retro, which of course fits in with the theme. In keeping with the ‘Forever Blue’ notion, the away jersey makes the traditional dark blue secondary colour of the Bulls’ and makes it primary – a stark contrast to the pinks, blacks and greens used for away jerseys in previous years. If anything we think this colour suits the design even better, as the darker shade compliments the white and red used for the various sponsor logos really rather well, and the shoulder stripes are more noticeable here, too. Ah yes, those shoulder stripes. Now, in the press release, the Bulls refer to the stripe that runs across the shoulders on both home and away shirts as, and we’re not making this up, “the classic PUMA owned 7cm Performance Stripe”. Now, we have absolutely no idea what any of that means, nor what makes it classic, or indeed why Puma have ownership of a load of dots arranged in a stripe… or what makes it a ‘Performance’ stripe for that matter… but who cares, it looks cool at least! In the last few years we’ve come to expect madness from the Bulls and Puma – innovative, occasionally brilliant madness, but madness nonetheless. And from that point of view this is almost a little underwhelming – this is disconcertingly sensible! But frankly, sensible isn’t a bad thing – this is a really nice take on a classic, grown up jersey that fans of all ages and tastes will appreciate, and when you’re honouring the long history of your team, that’s exactly how it should be.